Dr Jubril Abdulmalik, a consultant psychiatrist has said that the inaccurate media depictions of mental health must stop, especially in Nigeria. He made the call in Lagos on Wednesday, at a conference with media practitioners on ‘Mental illness and the Media’. The parley was part of proceeding for the annual general meeting of the Association of Resident Doctors (ARD), Federal Neuro-Psychiatric Hospital, Yaba. In his keynote speech titled, “The Media and Mental Health”, Dr Abdulmalik noted that the media must go beyond seeking traction when it comes to reporting on mental health issues and cases. Citing examples of recent reports on suicide cases in Nigeria, the astute psychiatrist said the media must approach reports of mental health from a human angle and take leads from positions that do not seek to glorify the ugly side of the tragic events. He said the impact of reporting mental heath issues inaccurately, can be highly devastating. “The dangers of negative media portrayals include increasing societal stigma and discrimination against persons with mental health challenges, causing it to be hidden away and become a source of embarrassment and humiliation to the individual and their family members. “It may also reinforce negative stereotypes about mental illness as a spiritual problem that is not treatable in hospitals. Unfortunately, this is often the case in many Nollywood movies depicting mental illness. “Specifically, the manner of media reporting on suicide deaths and its impacts on society are well established. There is clear evidence of what is helpful and what is harmful. Unhelpful ways of reporting suicide include providing details of their circumstances, name, background, personal difficulties, how they committed the act, splashing pictures, and summarily presenting it as a considered form of happy release for the individual from their troubles. “Whereas suicide is usually the result of a complex interplay of several factors including life stressors, the personality of the individual, presence of mental illness, available social support etc. “Unfortunately, such poor reporting practices and discussions tend to have the adverse effect of presenting suicide as a viable option out of life’s difficulties for people. And some vulnerable people will begin to identify with similar struggles in their own lives and may decide to also take the same action. “This ripple effect of excessive or sensational media coverage of suicide, leading to more suicides (or attempts) is known as the Werther Effect or copycat suicide. 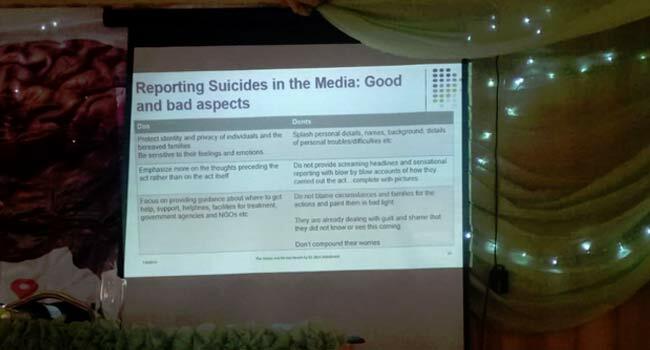 In recognition of the evidence-based findings of this relationship, many countries have now devised guidelines for the media to follow when reporting suicide cases,” Dr Abdulmalik said. Speaking on the role of the media in mental health advocacy, he said the media must help educate the people on “prevention methods, effective and cheap treatments, as well as the possibilities of rehabilitation” of those with mental health issues. He said the media must assume its role in the fight against discrimination, by helping the public understand the personal challenges of persons with mental illness and their families. Further reacting to the rise of suicide cases in and around Nigeria, Dr Abdulmalik said suicidal attempts can be discouraged by giving hope that people can cope with mental illness. He said this can be done by sharing and emphasizing positive stories of coping and overcoming suicidal thoughts. He also suggested that the media endeavor to get only experts in the field, to talk about issues regarding mental health. “What is helpful in reporting such cases is to focus on the thoughts that lead to suicidal behaviour and emphasise that they are not rational thoughts, and provide alternative sources of support, helplines and where people can go to for professional help when they are experiencing such thoughts and frustrations. “Getting experts to also provide information about available interventions is also useful. So, the focus should be on identifying the suicidal thoughts and remedial actions rather than the gory details of the act. The privacy and identity of the individuals and their families or the nature of relationships should also be protected as much as possible,” Dr Abdulmalik said. He surmised that the role of the media in mental health advocacy is a huge one, encouraging all media practitioners provide factual information, positively influence public opinion and health-seeking behaviour, while minimising harmful and stigmatizing reporting of mental illness and affected persons.